Chip Linton loves his career as an airplane pilot. Or he did, until a fateful August day when a flock of geese swooped into his engines upon takeoff and destroyed them. Any chance of survival rested on Chip discovering a safe place to land. As he hoped to attain the same success as Chesley Sullenberger on the Hudson River, Chip comprehends his lone option is to set down on Lake Champlain. Unfortunately, Sully’s triumph is not with Chip, for the wake of a nearby boat causes the plane to flip then crack in half. Besieged by despair at the loss of the passengers and crew, Chip sinks into a deep depression. Though there are survivors, Chip suffers survivor’s guilt as well as post-traumatic stress disorder. His lawyer wife, Emily, and twin ten-year-old daughters, Hallie and Garnet, become concerned about him, and Emily believes the way to aid his healing is by a change of location. Emily’s fond childhood memories of spending summers in New Hampshire with her grandmother give her the impetus to suggest the family move there for a fresh start on life. The Lintons purchase a three-story Victorian in Bethel, in the northern part of the state. Emily attains a position at a nearby law firm while Chip tries to recover and ponder what career path he should seek. He takes upon himself the job of restoring their old residence, and he discovers a sealed access in the corner of the basement. His curiosity gets the better of him, until he becomes obsessed with finding out what is behind the door. It also arouses his notice that there are 39 bolts sealing the chamber shut—39 representing the exact number of passengers lost on his fateful flight. Discovering the secrets hidden behind the basement door hampers Chip’s emotional recovery. And when he is visited by the spirits of three of his casualties he, understandably, slips further into his psychosis. As his stability deteriorates at an alarming pace, Emily and the girls become worried, spending more time with several of the area residents they’ve befriended. Emily soon learns this village holds a strange mix of citizens, and she begins to wonder why most of the older folks fixate so determinedly on her and her twins. 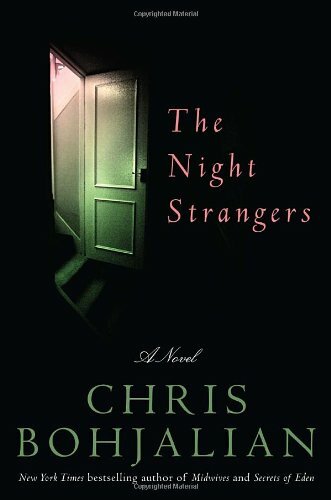 Reminiscent of John Saul’s creepy, brainy novels, The Night Strangers is a psychological thriller overflowing with horror and suspense. The descriptive prose stimulates all the senses, making us question our own (in)sanity. Several plot twists and turns make this a page-turner up until the very shocking ending.